The Certified Service experts at Stingray Chevrolet know precisely which parts your Chevrolet car, truck, or SUV needs —rely on them to maintain your vehicle with the same parts used to build it. Hearing a rattle? Had a fender bender? Head down the service lane for any type of auto repair service, major or minor. Our GM Certified Service experts are trained to know every inch of your vehicle and can help you keep it running like new. Simply schedule an appointment today. Your Chevrolet’s tires are the first and only contact with the road, so it is important to choose the right set when replacing them. 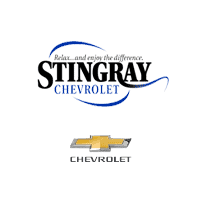 Stingray Chevrolet has Certified Service experts that will handle all of your tire needs. From checking tire wear to tire pressure our team can help you find new tires for your Chevrolet. Our Certified Service expert technicians can help make maintaining your vehicle simple and convenient. We are not only a one-stop destination for all your vehicle maintenance needs, but we also have convenient hours, competitive service & parts pricing and advanced technology to take the stress out of servicing your vehicle. From oil changes to tire rotations, brakes, batteries and multi-point vehicle inspections, we can handle it all. Simply call to schedule an appointment today or schedule online. Stopping power is crucial to a safe and successful driving experience. When you need brake service, visit Stingray Chevrolet and the GM Certified Service experts can recommend quality new brakes.